From birth to death, country stores provided every human need. On the shelves were food, tobacco, clothing, whiskey, hardware, farm and home goods, and patent medicines. Advertising signs and posters promised the wonderful and impossible. Hundreds of ordinary household items originally found for sale at the old country store are found here, from kitchen, bath, and table wares, advertising, candy containers, tobacco products, and much more. This book not only contains the history of such items, but the history of the country and general stores themselves. 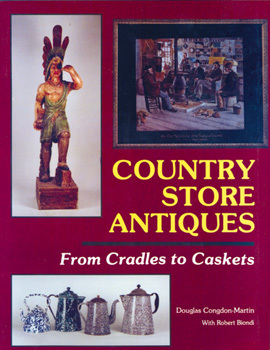 A must for any antique enthusiast or historian of bygone days.